First off, I think this model is really cool. 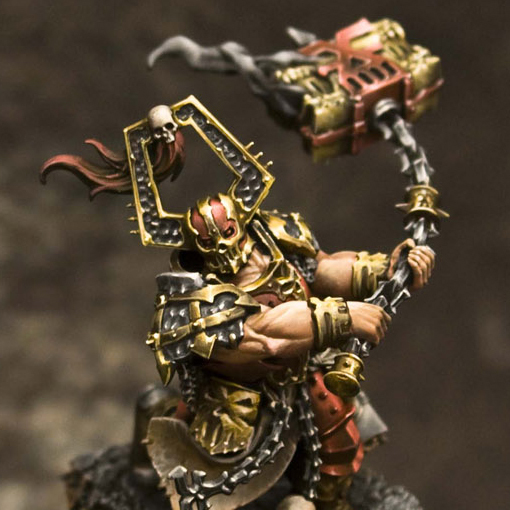 All of the new Khorne characters from GW lately have been awesome and what stands out the most for me with this sculpt is the sense of movement. 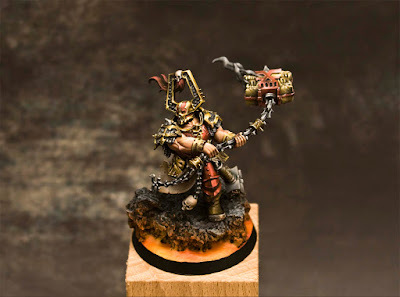 They really nailed the feeling of him swinging that anvil around, bravo GW. Now onto the painting, which is as smooth as you could ask for. All of the blends on this guy are ridiculously smooth and all of the lines crisp. This is some professional level painting here. The color palette is also really strong, restricting it to mostly just three colors. This isn't radically different from what GW did, but it eliminates the verdigris and flames to make you focus more on the red, bronze and silver. The colors on this guy are somewhere between the normal GW color palette and the more traditional desaturated tones you see from a lot of top level painters. I like that it has a "greyness" to it, but still seems like it has enough saturation. There is something very understated about the model as a whole. The base is a little cliché with the cork rocks and lava, but it works and frames the model nicely. The bright lava also provides a nice spot color that draws the eye. I feel like this mini is somewhat reminiscent of renaissance style painting in the tones and transitions it uses, especially when you look at the zoomed in picture of his head that excludes the lava. Overall a very nicely done model on an excellent sculpt. Expect another AoS Mini of the Week from this artist in the future. Be sure to check out more views of it on Cool Mini or Not, and show the artist some love if you like it.